We’ve grouped benches into six categories: benches with shelves, box-type storage benches, benches with drawers, benches with cabinets, bench and rack combos, and cushioned benches. 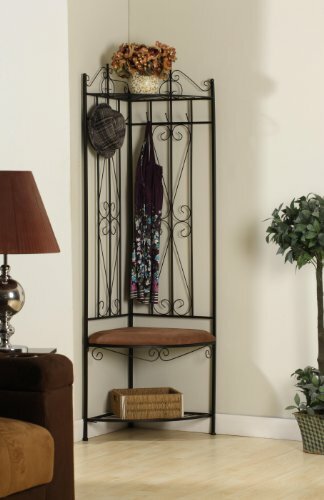 These are ideal for entryways and allow for some shoe storage and a comfortable place to remove your shoes. 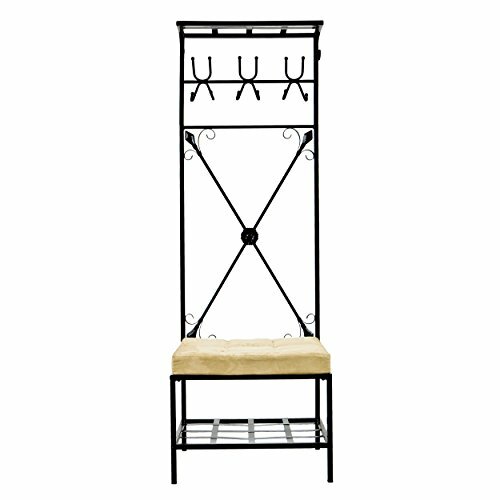 The bench and rack combos give you some hanging room for coats, which is nice if you don’t have a coat closet in your entryway. Entryways are the buffer between your clean home and the rest of the world. These benches can help you keep things tidy and avoid the minefield of shoes by your front door. Large boots will fit best on shelves instead of drawers or cabinets. Cabinet, box, and drawer storage keep shoes out of sight. Box-type storage is the least limiting in terms of shoe size, but you often end up piling shoes on top of each other. Cabinet storage makes keeping pairs of shoes together easy, but larger shoes may be a tight fit. Drawers are not quite as messy as box storage, but are restrictive on size. Another option you can consider, if you have a closet or interior door near your entryway, is a hanging organizer. There are examples of each below and you can skip to any section that looks interesting to you. 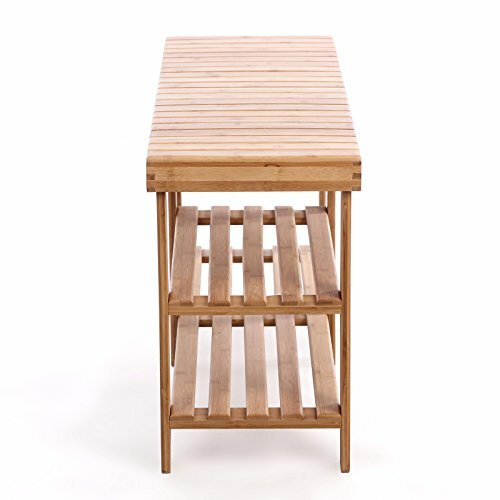 Bamboo is an attractive, sturdy, and affordable material used indoor and outdoor benches. The SONGMICS model is the longer of the bamboo benches shown here. 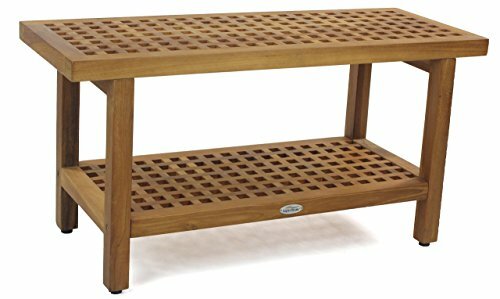 If you like the natural wood look but want something sturdier than bamboo, then consider The Original Grate Teak Bench by AquaTeak. Teak is generally more expensive than bamboo, but you can expect it to handle more weight and general wear and tear. The benches made by Boxwood Woodworks are truly beautiful and top-knotch quality. 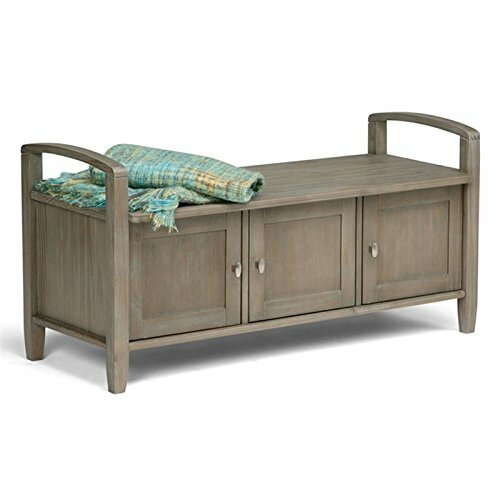 They are handcrafted in Ohio and delivered fully assembled. 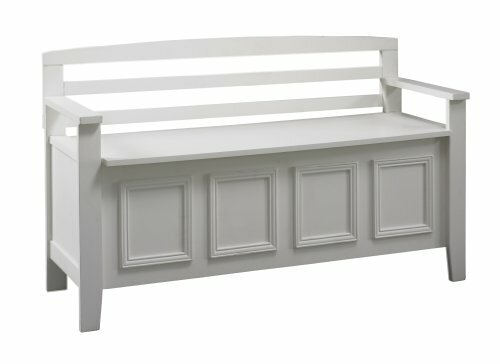 You can customize the size and color of your bench with Boxwood prior to ordering and even make custom orders. No particle board or other engineered wood, they’re all made from solid natural wood. You can get a completely custom bench from Boxwood Woodworking that’s handmade in the USA. 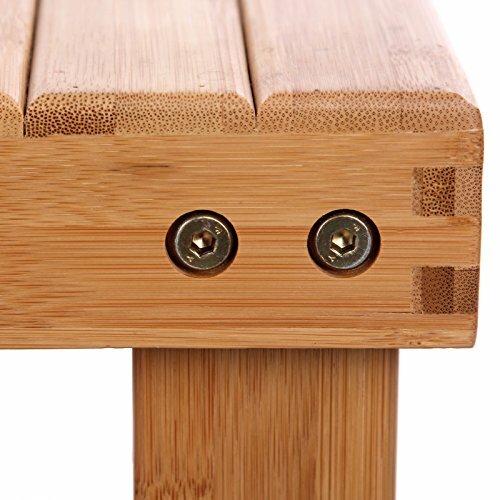 They have a variety of bench options available and you can get a matching Cubbie Coat Rack. Since these are made to order, expect to wait up to 2 weeks for your bench to be completed and shipped. 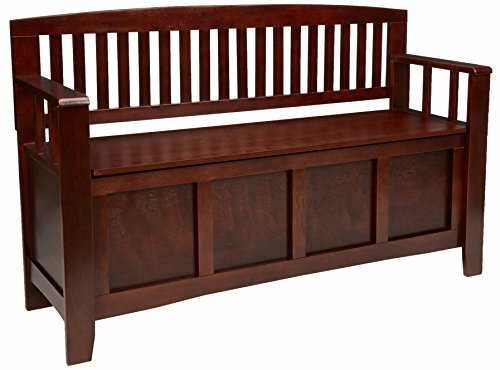 The customization options with the bench from Boxwood is most appealing if you plan to put the bench near your front door, or it’s otherwise prominently displayed and you’d like for it to match your decor. 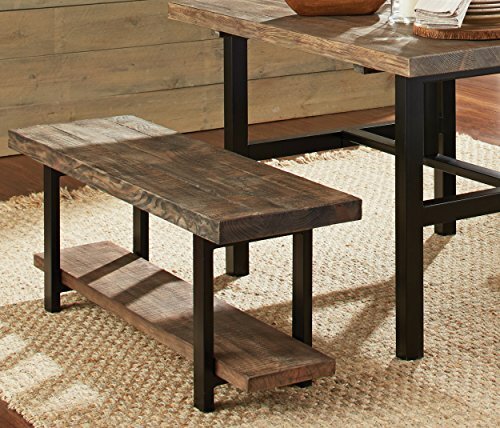 For a more rustic look, the AquaTeak or Alaterre benches will fit your needs. Teak has a richer, darker color than bamboo. The three options we’ve mentioned so far are also going to be the most sturdy. One of the common complaints with the bamboo benches is how much they creak when you sit down. Bamboo will flex and you may need to check the bolts for tightness occasionally, but they are reasonably sturdy. However, two adults would not want to sit on the bamboo bench. The main attraction with bamboo is their low cost. The center legs improve the stability and the single tier section is tall enough to guarantee you can fit even a pair or two of large boots. After studying reviews and manufacturer guidelines, we found bamboo to be the most concerning when it comes to weight. If you’re pushing the upper side of the weight limit, 264 lbs, then most bamboo benches aren’t for you. Hey, at least that’s an excuse to spend more money on one of the other, more robust benches! This is a simple, but solid bench made with solid wood and a metal frame. It’s the sturdiest in this category. The single shelf isn’t a ton of storage, but it can hold just about any size shoe. Next up, we’re going to take a look at the solid teak wood benches from AquaTeak. These are one of the sturdiest options in this category, and they’re rich in color and texture. These are some of the most popular benches from AquaTeak that have a variety of shaped and wood designs. These teak benches are beautiful and if these catch your eye, then check out our more in-depth article on teak benches. Many people use them in their walk-in showers or outdoors. The Original Grate model is 36″ long with a barred frame for the seat and shelf. The concave seat adds a little extra comfort over the Grate model and has a more natural wood look. This is a very popular model with wooden slats that allow for water drainage if you wanted to use this outdoors or in a shower. 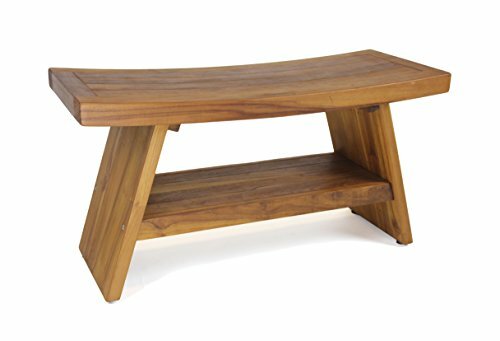 The angled design gives this bench is a throwback to the hip-and-gable roof found in East Asian architecture, hence the name. Occasionally, you may want to touch-up the finish on your teak bench, which just means applying a coating of teak oil. This is something you might do yearly or every few years that brings back the original color of the teak. As you can imagine, getting into each and every crevice of the Grate model is a bit more involved than the others, but it’s not a huge problem as those areas aren’t very visible. 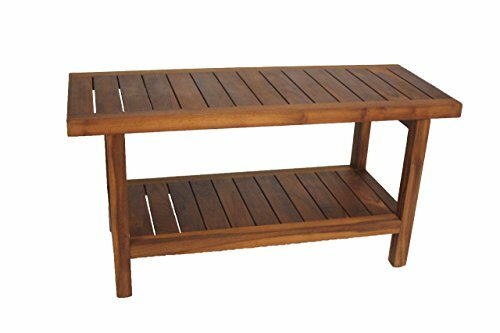 Unless your teak bench is out in the elements, there’s no requirement to apply teak oil to maintain the integrity of the wood. Sunlight, large temperature fluctuations, and lots of water can eventually damage any type of wood without proper treatment, and even then the wood still ages. That’s right, you can make your bench more comfortable by adding a cushion. There are tons of different color and size options available. The one pictured above is 36″ wide and will fit most of the teak benches above. 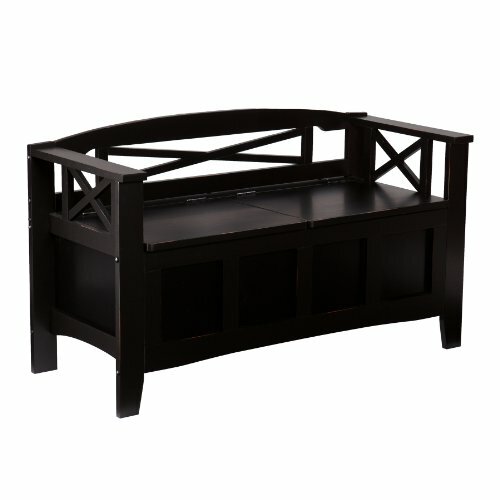 Of course, you can find cushions to fit any of the benches on this page as well. Box-type storage benches give you the most flexibility for storing things of various sizes, like umbrellas and shoes. However, you often end up stacking things up which makes it difficult to reach things at the bottom of the pile. This bench is made from a mixture of solid hardwood and wood composites. This bench is made from MDF and pine. The seat is split in half and allows for opening one side while still sitting on the other. This bench is made from solid pine, not wood composites. The quality of this bench is a step above the Lindon an Southern Enterprises models. Simple and affordable. This bench is made from wood composites and MDF. Drawers are geared more towards storing tools or other miscellaneous items near your entryway or mudroom. Small shoes will likely not be an issue, but large boots are out of the question. Baskets are another option that we’re including in this section since they function the same as drawers, but are easier to remove and clean if needed. Baskets also more efficiently occupy the storage space since there is no sliding mechanism and they aren’t rigid and can flex slightly to accommodate your shoes. 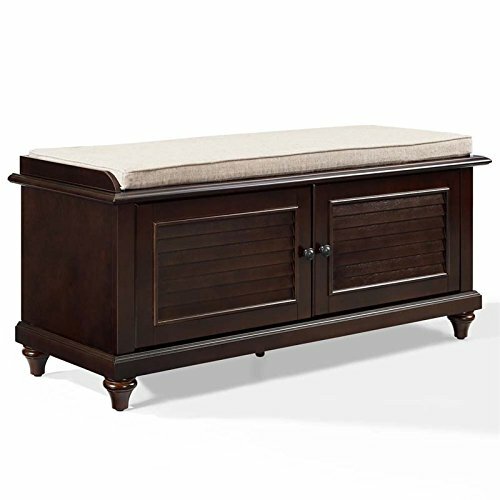 The Victoria Entryway Bench by Furniture of America is a great choice if you aren’t concerned with storing large pairs of shoes and also want some small drawers for miscellaneous items. The Simply Home Burlington, Dakota, and Sea Mills offer a variety of styles to pick from. The Sea Mills is the longest of the three, with the Dakota a close second. Each cubby on the Sea Mills will not likely fit a large size men’s shoe. The combination of cubbies and drawers let’s you keep all sorts of gadgets you occasionally need in the small drawers, but you will be limited on shoe storage. Shoes can go in the baskets and other misc items can go in the drawers. There is a 42″ and 60″ model available. The two large drawers mean less chopped up space, so you’ll be able to store larger shoes than the bench above. This is another solid pine bench; no wood composites. Baskets are easy to remove and keep clean. They also help keep shoes separated and avoids piles of shoes you have to dig through. The 5 shoe storage cubbies can fit typical tennis shoes or flip-flops, but large boots are not possible. The cushion is 100% Canvas and you have several color options to choose from. Made from solid pine wood. Largest baskets on this list. 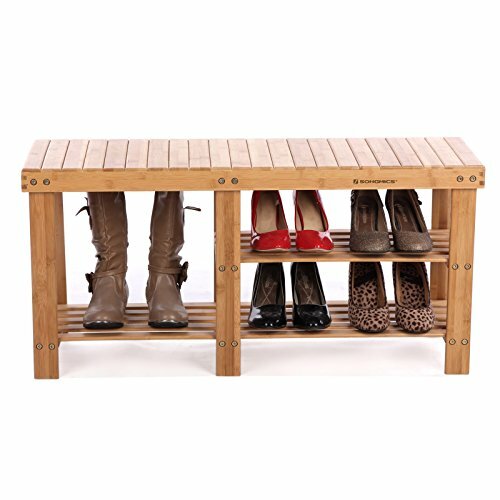 Benches with cabinet storage are a great way to store shoes and more. The Simpli Home model is made of solid pine and has more finish options than the Baxton models. 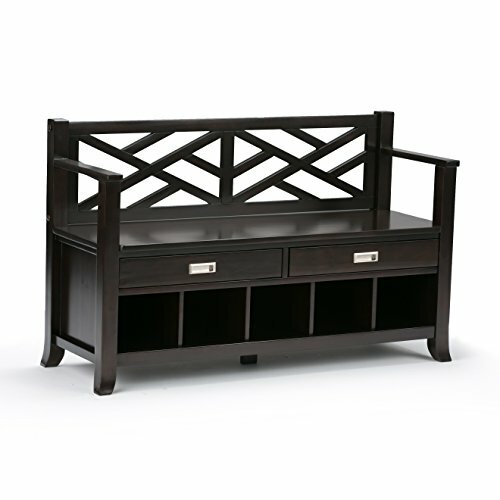 The Baxton entryway benches are a great budget option, but are made from engineered wood. The Lakeville by Linon has soft colors that compliment a bright to neutral color scheme. The combination of shelves and cabinets means you can put smaller shoes on the easy-to-access shelves, while also keeping large boots in the cabinets. 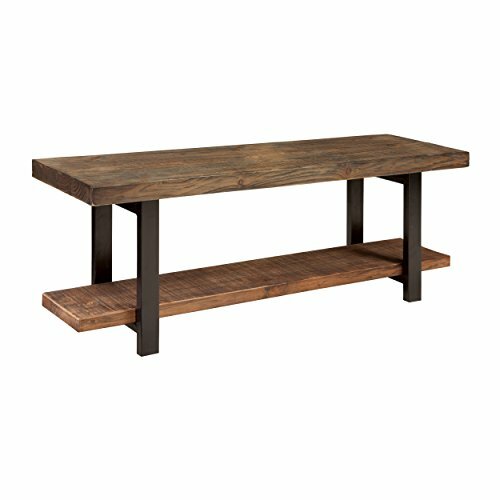 This bench could be put in entryways or bedrooms. The quality is superb and the finishes are varied enough that you can match them with any decor. Engineered wood with Dark Brown Wood Paper Veneer. Foam padded seat with faux leather. Gray, slate blue polyester and linen upholstered seat. Made from solid wood and MDF. 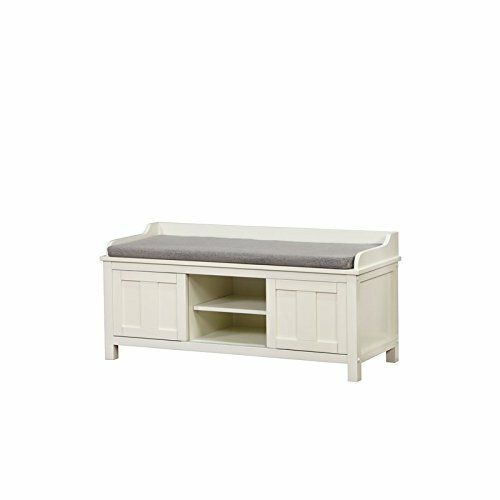 This bench has a more traditional look and optionally comes in either espresso or white. Each one of these benches have cushioned seating, but have a variety of different types of storage. If you’re looking for affordability then the ClosetMaid is a great option. The Winsome Townsend is also affordable and has large cubbies. 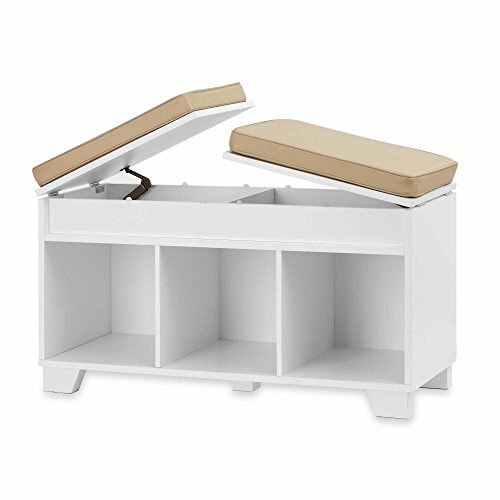 If you’re looking to store small items, and not just shoes, then the hidden storage under the top of the Real Simple Split-Top Bench is an excellent choice. 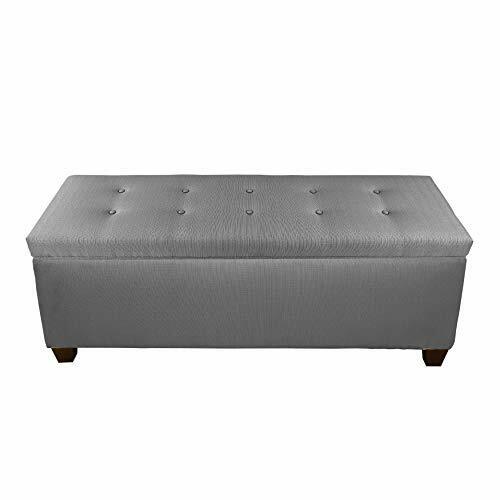 The Sole Secret Ottoman is great for an entryway or bedroom. Tthe variety of color and size options means you could get one to match your home’s style. The cubby storage will fit up to a men’s size 14. 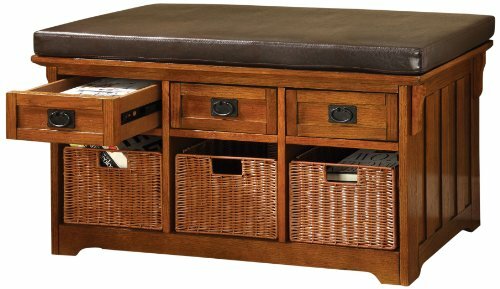 The small model ottoman has 14 adjustable cubbies, while the large version has 18. 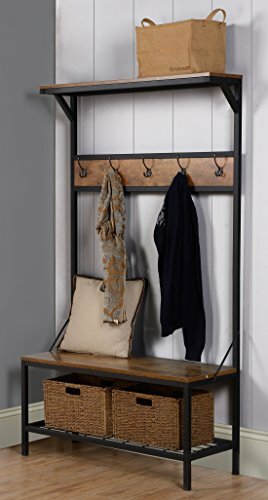 This bench is similar to the ClosetMaid above, but the storage is more divided. If you don’t have tall boots to store, this may be a better option, since you won’t be piling shoes on top of each other. The seats lift up to real two storage compartments. Multiple color options available that will match any decor. This is the longest bench with the most storage in this category. Hydraulic arms for easy opening and closing. There are a ton of options available in this category, but we’re going to look at three models. Most of these designs are metal, which is attractive but doesn’t hold up quite as much weight as the other wooden benches we looked at above. These models are a combination of a bench, shelves and coat hooks. There are models designed to fit into a corner or just against a wall. A very traditional black metal and natural wood design with excellent reviews, and an affordable price. Metal frame; Top and Middle Shelf made from wood composite.